Innovative and original, the Clifford Bar Stool Grey & Charcoal Fabric is in a league of its own. A charming design that is super comfortable and just as stylish, the Clifford has many desirable features that make it a sumptuous item for your bar area. Charming two-tone upholstery creates a striking design, with cool grey fabric covering the front of the seat, whilst the rear and sides feature contrasting charcoal fabric. The contoured seat is comfortably padded and includes a high backrest, both of which are inlaid with chic vertical stitching. Below, the chrome frame houses a variable height gas lift mechanism, and a 360-degree swivel feature allows for easy access to the bar area. A stylish triangular footrest is included for practicality, and is supported by a flat weighted base for excellent stability. The Clifford is finished with a protective rubber guard underneath, enabling use on a range of floors. "Very comfortable to sit on"
Great quality stools - look good and are solid, best value fabric stool on the market. Great stools, very easy to assemble, helpful delivery man. Haven’t yet used them in the area we are going to use them as kitchen still being refurbished but I am pretty sure they are going to be just the ticket. Love the grey front, black back, heavy base so not going to be tipped over. Very happy. Very comfortable, hard-wearing. Easy to assemble following the instructions. Very happy with this purchase, thank you. I had previously purchased chairs from Atlantic which I was happy with, so they were my first choice when looking for bar stools. Without doubt they have the best range online. I bought four of the Clifford Stools for my new kitchen and they are perfect. Great quality, stylish at a very reasonable price. I ordered Sunday evening and took delivery of them on the Tuesday, well packaged and kept updated with delivery details and timings. Can't fault anything. 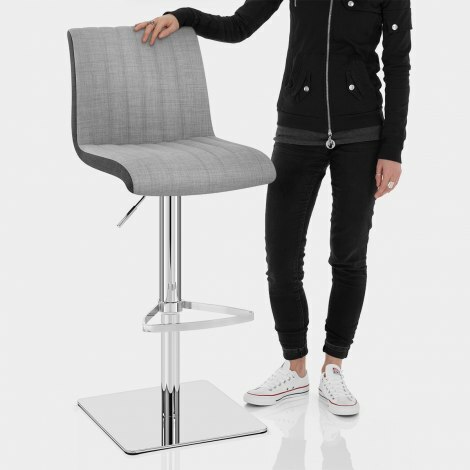 I did a lot of reasearch before selecting the Clifford bar stool in Grey and Charcoal fabric. When received they met my expectations. 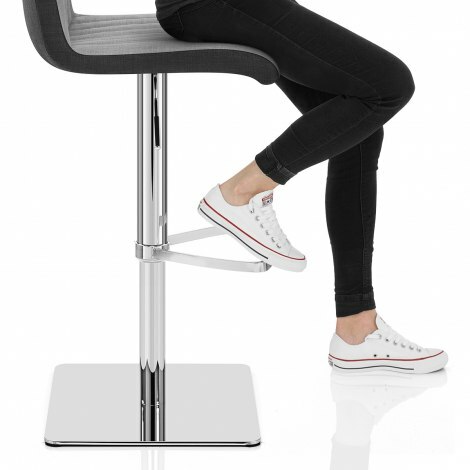 They are fully adjustable with 360 degree movement and the base is substantial for the size of the seat. The fabric matches my kitchen perfectly and is very comfortable to sit on. I would definitely recommend this product. Delivery was as stated when I ordered.